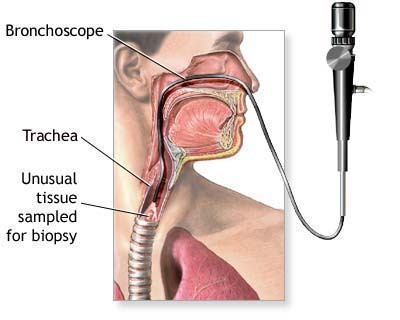 Bronchoscopy is a technique of visualizing the inside of the airways for diagnostic and therapeutic purposes. An instrument (bronchoscope) is inserted into the airways, usually through the nose or mouth, or occasionally through a tracheostomy. This allows the practitioner to examine the patient's airways for abnormalities such as foreign bodies, bleeding, tumors, or inflammation. Specimens may be taken from inside the lungs. The construction of bronchoscopes ranges from rigid metal tubes with attached lighting devices to flexible optical fiber instruments with realtime video equipment. Once the tube is inserted into the lungs, The doctor may send saline solution through the tube. This washes the lungs and allows the doctor to collect samples of lung cells, fluids, and other materials inside the air sacs. This part of the procedure is called a lavage.Sometimes, tiny brushes, needles, or forceps may be passed through the bronchoscope and used to take tissue samples (biopsies) from your lungs. The pieces of lung material that are removed are small. The doctor can also place a stent in the airway or view the lungs with ultrasound during a bronchoscopy. Why the Test Bronchoscopy is Performed ? How does a patient prepare for bronchoscopy? Usually, patients undergoing bronchoscopy should take nothing by mouth after midnight prior to the procedure. Routine medications should be taken with sips of water except for those drugs that can enhance the risk of bleeding. These medications are aspirin products, blood thinners such as warfarin (Coumadin™), and non-steroidal anti-inflammatory products such as ibuprofen. (These drugs must be discontinued at varying numbers of days before the procedure, depending on the medication. Patients must consult their doctors for the appropriate schedule in their particular situation.) The doctor will also want to know of any drug allergies or major drug reactions that the patient may have experienced. The bronchoscope is now being used with lasers to help remove and destroy tumor in the lungs. Sometimes, probes can be passed through the scope to freeze bleeding sites or to shrink tumors. Some newer technologies are on the horizon and may play a future role in the management of asthma and emphysema. There is data to suggest that warming the linings of the airways can reduce asthma attacks. Studies are also now underway investigating one-way valves placed in the upper lobe airways in patients with emphysema. The hope is that this investigational therapy will simulate the benefits seen in emphysema patients that receive lung volume reduction surgery. What Are the Risks of Bronchoscopy? 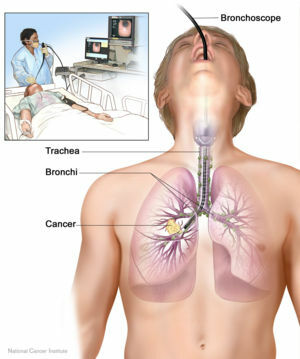 Bronchoscopy usually is a safe procedure. However, there's a small risk for problems, such as: A drop in your oxygen level during the procedure. Your doctor will give you oxygen if this happens. Minor bleeding and developing a fever or pneumonia. A rare, but more serious side effect is a pneumothorax. A pneumothorax is a condition in which air or gas collects in the space around the lungs. This can cause one or both lungs to collapse. Usually, this condition is easily treated or may go away on its own. If it interferes with breathing, a tube may need to be placed in the space around the lungs to remove the air. A chest x ray may be done after bronchoscopy to check for problems.